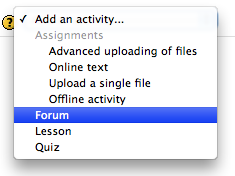 Moodle allows you to create any number of “forums” in your course site. Each forum can represent a different topic to be discussed or you can chose to have all topics discussed in one general forum. Forums are similar to the comments on blog posts. In particular, a forum topic is similar to a blog post in that both represent the “topic” of discussion. Blogs tend to focus on the topic post which can vary in length and is always displayed above the comments on that post. Forums tend to focus on various sub-topics within a given forum and organize all discussion around these sub-topics. Most forums display a list of all topics/sub-topics in a table with the number of comments in each.